Two Russian GRU officers Alexander Alexandrov and Yevgeniy Yerofeyev have been taken to court hearing in protective gear. A photo was published on Facebook by journalist Alyona Lunkova. 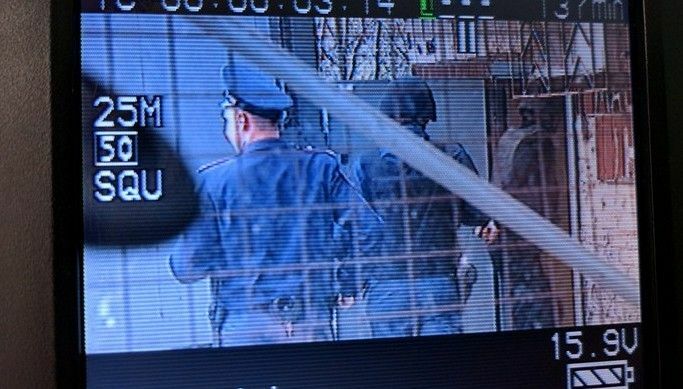 The guards escorted Russian GRU officers in bulletproof vests and helmets. In the courtroom, Aleksandrov and Yerofeyev had the protective gear removed. As UNIAN reported earlier, two Russian GRU officers Aleksandrov and Yerofeyev were captured by Ukrainian troops near the town of Schastia in Luhansk region on May 16. They were injured in a shootout. Ukrainian soldier Vadym Puhachov was killed in a fight with them. Read alsoPoroshenko offers Putin to swap Savchenko for two Russian soldiers (video)On May 18, the then SBU Chairman Valentyn Nalyvaichenko said that the Russian military would be put on trial under Article 258 of the Criminal Code of Ukraine for their participation in a terrorist organization. On May 22, Kyiv's Shevchenko District Court ordered that Russian citizens Aleksandrov and Yerofeyev be kept in custody until the investigation is underway. On July 29, they were transferred from hospital to a pre-trial detention center. On August 26, Chief Military Prosecutor of Ukraine Anatoliy Matios said that an investigation into the case of Aleksandrov and Yerofeyev captured by Ukrainian troops in the Donbas conflict zone on May 16 was over, and the indictment against them might be sent to court within 10 days. On December 23, 2015, the court extended the detention period for Aleksandrov and Yerofeyev until February 20, 2016. On March 21, Holosiivskyi District Court in Kyiv ruled to extend until May 19 the term of holding in custody of two Russian military intelligence officers Yevgeny Yerofeyev and Aleksandr Aleksandrov.